I haven’t ridden a horse in years, but when I did ride, I enjoyed dropping the reins to see where he would go. Logan Darrow’s exercise, posted on The Mindful Horse Woman four years ago, is wise advice for everyone with a horse. I enjoyed trusting the horse and I think he enjoyed the fact I wasn’t controlling what he was doing. In the same fashion, I enjoyed driving my old car aimlessly to see where I would end up. It wasn’t quite the same since I really couldn’t let go of the steering wheel. But the concept was similar, somewhat like following winds, currents, and tides in a boat: giving up control and enjoying the ride. More often than not, whether it was by horse or car or sailboat, such rides took me where I needed to go even though I didn’t consciously know it. What I saw changed me. Where I ended up the was a person I needed to meet or something I needed to witness. I feel the same way about poems, short stories, and novels. While we may have a theme, a set of characters, and a general plan for the action, the work ends up better if we trust ourselves and the material enough to drop the reins. No, I’m not advocating typing gibberish or writing while drunk. Yet stories seem to flow in a natural direction once you get them started. Like trying to force water to flow uphill, forcing a story away from its natural direction is not only a lot of hassle, the result looks unnatural. I was reminded of this several days ago while working on a short story about a man in a rest home. Unusual for me, I intuited how it was going to end. I seldom know that. This time I did know it and I didn’t like it. So, like gently neck-reining your horse one direction or another, I “encouraged” the story to go down a path that didn’t lead to that ending. A fight ensued. Clearly, like a horse who wanted to head for the barn, the story refused to go anywhere that didn’t lead to that ending. Yes, I know, if you can’t stop your horse from racing to the barn, you’re a poor rider. So, there always needs to be a meeting of the minds between you and your horse about what it is you’re doing. The same is true for a story. So, my story knew we weren’t going to gallop toward that ending on page one. And I learned that no matter what else happened in the story, its natural ending was a destiny the characters couldn’t avoid. We can’t always drop the reins when we’re riding or writing, but we probably don’t drop them enough. The story’s almost finished now. The ending the story wanted makes sense. It also coincides with what I wanted to say better than ending the story some other way. I have no idea why this process works the way it does. We could speculate, I suppose, but even if we found the answer it wouldn’t change the process for the better. If you don’t like the story you end up with, you can hide it at the bottom of your sock drawer and move onto something new. Coming soon, a collection of nine short stories that more or less did what they wanted. If you were God, what would you do next? Most people are scared to answer that question. In fact, they’re down right superstitious about even hearing the question. Those who do answer the question tend to say either: (a) I would smite so and so, or (b) I would create world peace. Smiting a bad guy is easy. Creating world peace is easier said than done because there are too many variables involved for a mere human to deal with. Okay, here’s where you find out that’s a trick question. Those who aren’t writers often say that within any given novel, the author is a god. S/he can smite everyone who needs smiting and decree world peace without having to worry about the mechanics of it. There are risks of acting too God like while writing a novel or a short story. Presumably, God (Himself and/or Herself) doesn’t have to worry about bad press whenever He or She manifests and Act of God. Human beings, being what they are, tend to believe that if an Act of God occurs and it’s bad, it must be their fault. They sinned, and so an Act of God paid them back. Basically, critics and readers don’t want the author to play God as s/he writes because the resulting story is unsatisfying, outside the reality of the novel, an example of the author writing himself/herself into a hole and cheating to get out of it, and other nasty criticisms. Readers, frankly, are never willing to say that the author moves in mysterious ways and let it go at that. Authors who move in mysterious ways are variously bad, experimental, sinful, crazy, or tetched. Critics and readers typically want more order than authors want. They want the books they read to be safe and to fit within the world as they see it. The bottom line is, the author can’t play God and has to let the story unfold however it unfolds. If you–as the author–step in and take any action whatsoever, it has to be sneaky and impossible for critics and readers to detect. That’s the reality of being an author. You have the power, but you can’t use it. Let’s say you have an idea for a story in which a 21st century man walks across Florida in search of the fountain of youth. If you’re an organized person, you might rush to your computer, open a DOCX file and start creating an outline. If you’re a disorganized person, you might wander the blue highways of Florida for a few years and see what kinds of ideas come to mind. Maybe you’ll even find the fountain of youth. 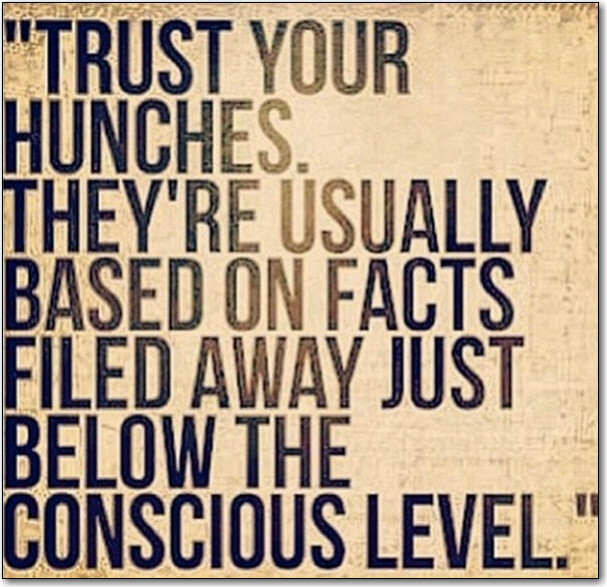 We’d all be better writers if high school English teachers taught us the value of hunches. I don’t advocate either approach. Outlines tend to restrict the story before it has time to take shape–that is, everything you don’t put in the outline tends not to be considered. Wandering tends to be addictive and pretty soon the story gets put off for a year or two and then a year of two more. Whether you want to call it creating your own reality, fate, destiny or the focus of your awareness, thinking or researching one thing tends to draw similar things to mind. If you’re allowing your story to unfold, these similar things can add a lot to the plot, theme, characters and settings. For example, while working on my upcoming novella about a conjure woman, I began finding multiple references linking conjure and the blues. I like the blues and so I looked further (trying not to wander and become distracted with my research) and found that many blues songs refer to conjure women or being “tricked” (hexed) or needing some good gambling MOJO. These ideas enhanced the plot of my novella because blues songs and a juke joint became part of the story. Had I outlined the story in advance, covering the major ideas I had for it, I might not have found how well the blues fit what I needed to do. Many writers I know tell me that when they research a subject–and don’t get in a hurry about it–the research leads them from one thing to another thing and suddenly (as though it’s destiny) they find something very crucial to their story. How? I don’t know. But the “how” doesn’t matter. The results are what matter. If you’re writing a novel about a modern day Ponce de León, reading about the historic person who purportedly sought the fountain of youth might generate ideas. Where in Florida did he go? Look at those places and keep your mind open for landforms, local legends, and perhaps a little history about the kinds of people who have lived there. This might look like a waste of time because, after all, most of us were told in our high school English classes to start themes, book reports, term papers, etc. with many hours of work on an outline. Sooner or later, you might want to do this. When it comes to fiction, later (and possibly never) are better than sooner. Let’s say the story you want to write has been nagging you to write it. Part of “writing it” is finding it. When it unfolds naturally, then you’ll probably end up writing the story you really wanted to write even though you didn’t know you wanted to write it the way it turned out when the idea first came to mind. Writing that outline first has about as much chance of resulting in a good story as a marriage has of working out when you marry somebody during the first date before you know who they are. Malcolm R. Campbell is the author of “Emily’s Stories,” a three-story set about a young girl who allows her intuition to guide her so that she can solve problems her practical-minded parents can’t solve.